TFS 2015 is around the corner, and with it comes a whole new build system. All the biggest pain points from the existing build system (now called “XAML builds”) are gone and instead we get a light weight build system with a web UI that makes it very easy to customize our build processes and that doesn’t perform a lot of magic such as redirecting your build output for example. In this post, I will show you just how easy it is to setup a build that builds a standard ASP.NET web application, generates a web deploy package as part of the build and then pick up this package and deploys it to a Azure web site. 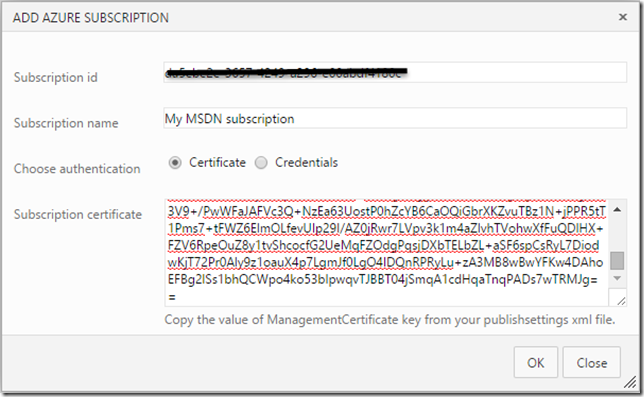 As part of this, you will also see how smooth the integration with Azure is when it comes to connecting your subscription. So, let’s see how we can build, test and deploy this application to Azure. First of all, you need to add your Azure Subscription to TFS. You only need to this once of course (or at least one per subscription in case you have several). Click the Add new Azure Subscription link on the top left. 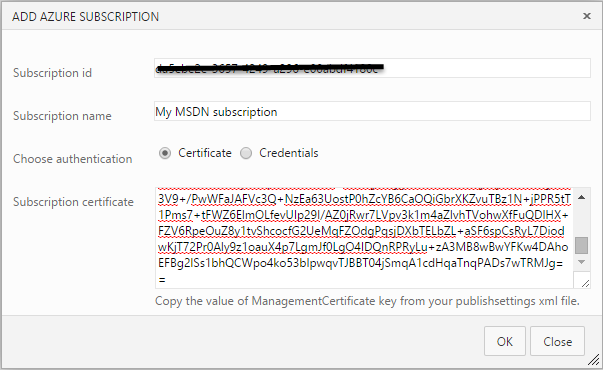 Now you need to enter the Subscription Id and the subscription certificate (you can use credential as well, but using the certificate option is more secure). That’s it, now we can crate a build definition for our application. 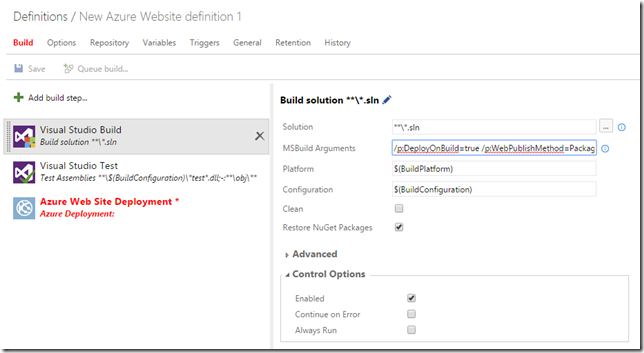 This will create a build definition with three steps, one for build the solution, one for running all the tests and one for deploying a web site to Azure. 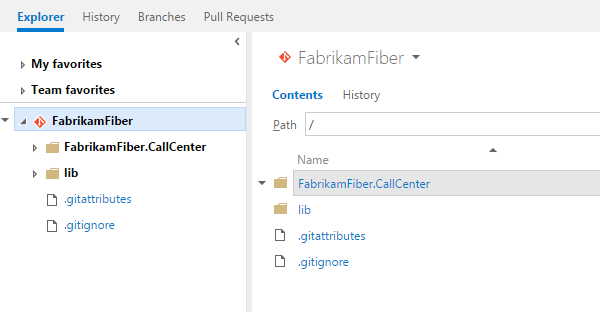 Note: For this post, I disabled the test step since not all tests pass in the default FabrikamFiber solution. 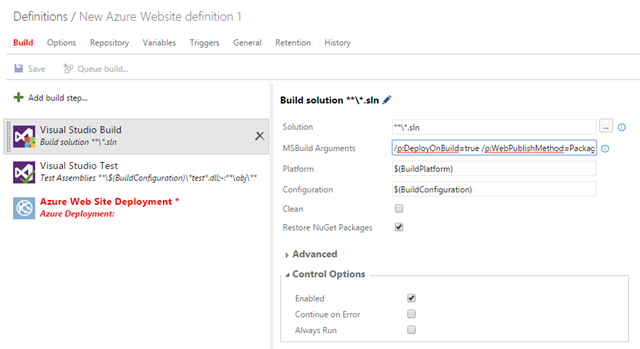 These are standard MSBuild parameters for triggering and configuration web deploy during compilation. 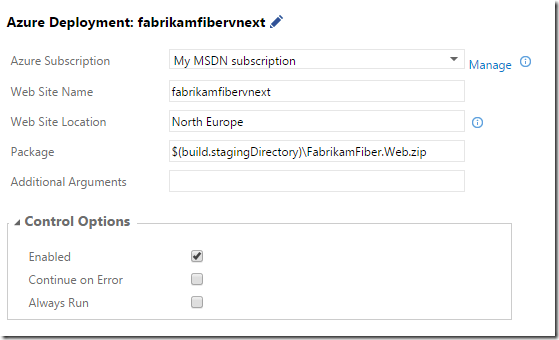 These specific settings will create a web deploy package and put it in the staging directory of the build definition. 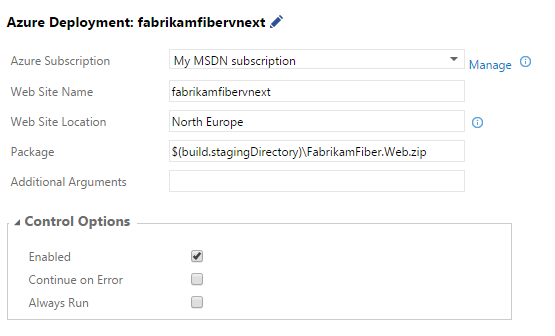 it will be http://fabrikamfibervnext.azurewebsites.net. We also need to specify the Web Site Location for this web site. The final parameter that we need to specify is the Package. By default it will fetch all zip files located in the staging directory. I want to deploy the FabrikamFiber.Web application, so I change this to $(build.stagingDirectory)FabrikamFiber.Web.zip. That’s it! 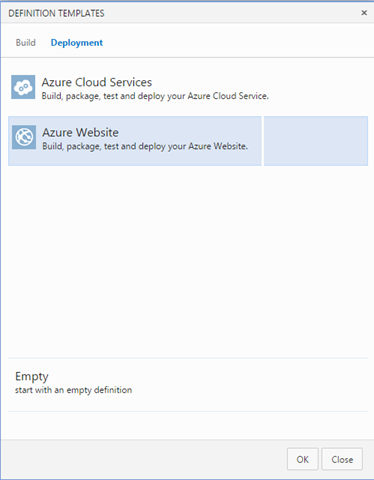 Save the build definition and queue a new build.After it has completed, you should see a log that looks something like this and you should have a web sites published in Azure. As you can see, all steps in the process are shown to the left and you can easily see the output from each step. If you’re familiar with the FabrikamFiber sample solution, you know that it actually has two web applications in the same solution, FabrikamFiber.Web and Fabrikamfiber.Extranet.Web. This will now first build the solution and then publish both web sites to Azure. 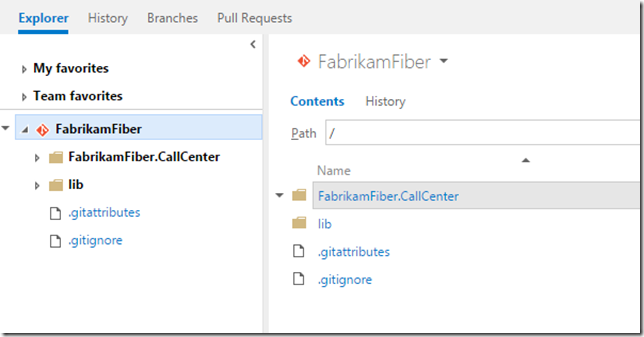 Now you have seen how easy it is to build and deploy web applications using TFS Build vNext.